Despite the usual ups and downs, over the last fortnight the LHC has succeeded in delivering of the order of 500 inverse picobarns a week. The machine parameters are now at 1380 bunches, 1.3x1011 protons per bunch, and using the smallest possible beam sizes that the SPS can currently produce. These settings, together with the 1 m ß* squeeze, have allowed ATLAS and CMS to receive over 10 inverse picobarns an hour at the start of a fill. "We'll miss you." 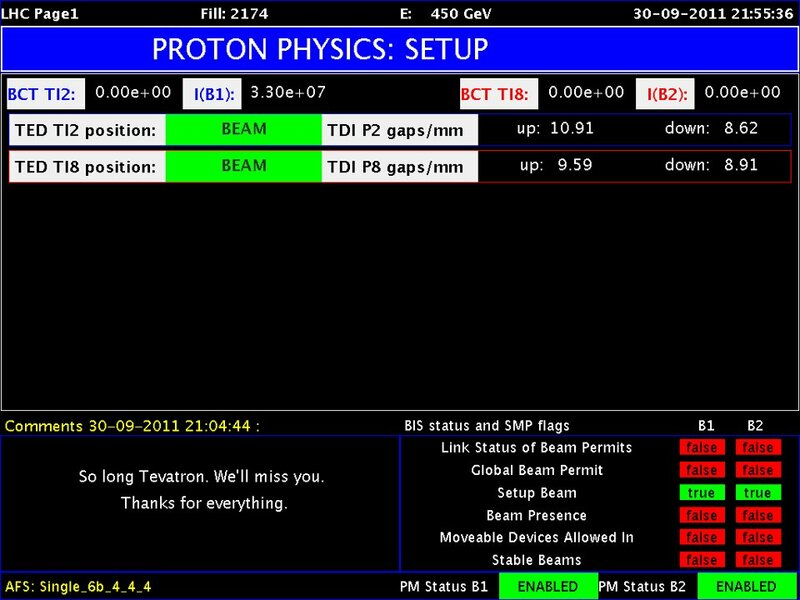 The Tevatron was given a final salute on the LHC1 screen on 30 September 2011, the day of its shutdown. There is a little over three weeks to the end of this year's proton run and the operations team is trying to squeeze in a number of special runs for dedicated studies. These include testing the machine with a beam with a 25 ns bunch spacing (which would open the way to doubling the number of bunches), and performing a high "pile-up" run in which single bunches with maximum intensity are collided. This would allow ATLAS and CMS to probe the effects of an exceptionally high number of collisions per bunch crossing on their detectors. Currently, at the start of a fill, ATLAS and CMS are seeing a peak of 20 events per bunch crossing. With an increased bunch current and an even lower ß* this figure could go even higher. LHCb has also passed the 1 inverse femtobarn mark, warranting a small celebration in the CERN Control Centre. Preparation for the LHC ion run is in full swing. Intense ion beams were successfully produced and accelerated up to the LHC injection energy through the LINAC3, LEIR, PS, and SPS.